This cilantro pesto recipe is full of flavor with hints of sesame, lemon and garlic. It’s nut-free too. But, full of crunch and texture from crispy, roasted chick peas. 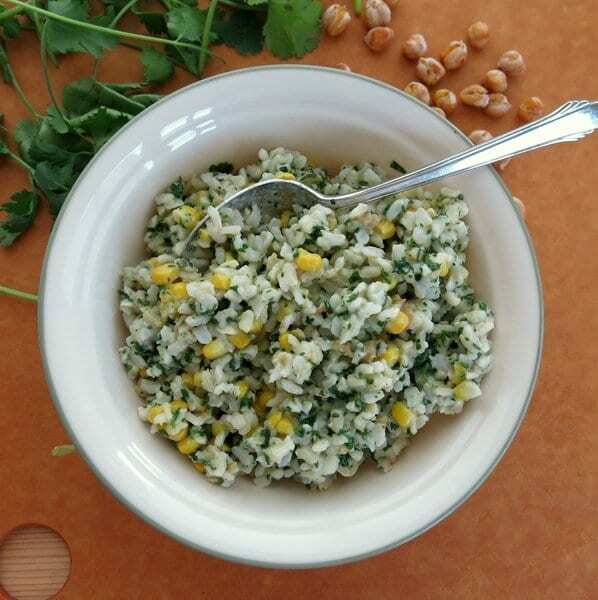 There are plenty of terrific recipes that are greatly enhanced by this herb, such as Baked Ravioli Casserole, Black Bean and Quinoa Soup and Caribbean Salad. Chick peas? Well, yes…although I do love chick peas almost as much as I love cilantro, this inspiration is really out of necessity. My daughter has a nut allergy, so the often-used almonds were out. It turns out the little garbanzo bean is a terrific way to add taste, texture and crunch to pesto! To crisp up the chick peas, roast them in the oven at 400 degrees F for 25-30 minutes. Since you’re not using the whole can, doctor up the rest using this spicy chick pea recipe or this crispy curried chick pea recipe. 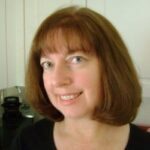 (And…yes, I have been wondering what would happen if I used spiced chick peas in the recipe!) Let me know if you beat me to this experiment! Generally, I don’t not use that much cilantro in a recipe. So, pulling the individual leaves off the stems is no big deal. But, packing 2 cups full of leaves is a whole new ball game. I used scissors to cut off the thin stem shooting off the thicker one. The offshoot stems are tender and can be thrown right into the food processor. Pesto is soooo easy to make. Just throw everything into a food processor and stream in the olive oil. I only had 1 cup of cilantro so this is a half batch. I like the advice from Oh Sweet Basil on storing pesto. I had a little jar in the fridge that did not last very long. There are endless ways to use pesto. Stir it into rice, pasta or vegetable soup. Spread it on a baguette or pizza crust. Slather it on chicken for a quick and tasty dinner. Use it in Phyllo Wrapped Salmon. It’s like a magic condiment ready to transform your next meal! 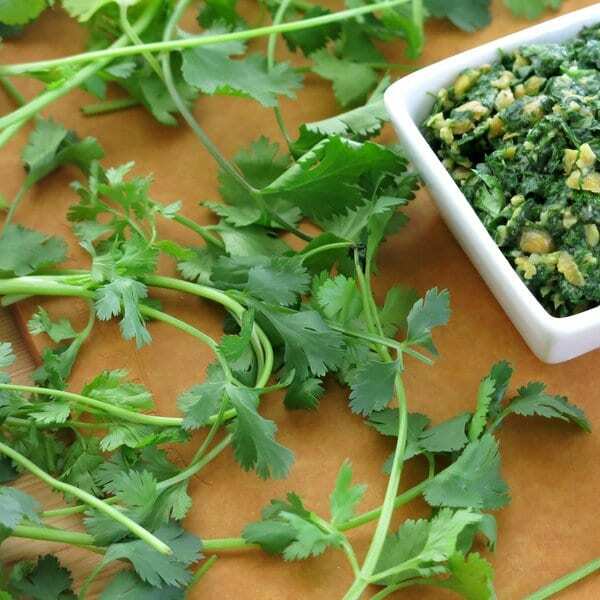 Cilantro pesto is full of flavor with hints of sesame, lemon and garlic. It's nut-free too yet full of texture and crunch from crispy, roasted chick peas. Place chick peas in a single layer on a baking sheet covered with aluminum foil. Roast chick peas for 25-30 minutes. Chickpeas will "rattle" in the pan when done and be slightly crunchy on the outside. Allow chick peas to cool. 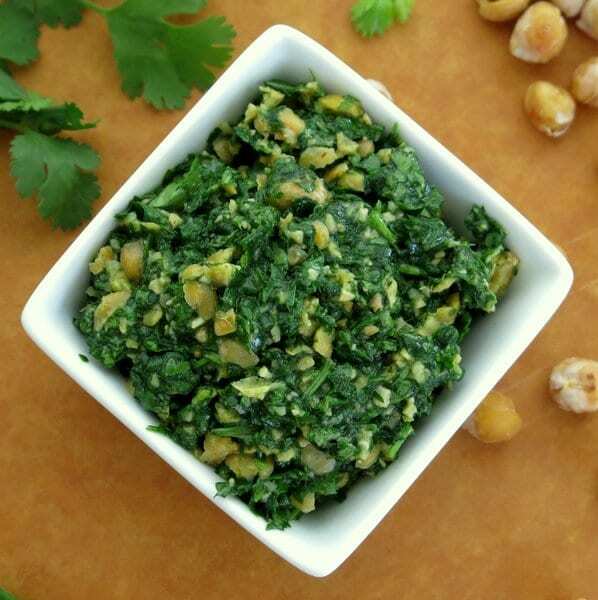 Place cilantro, garlic, chick peas, lemon juice, sesame oil, salt and pepper into a food processor. Slow stream in olive oil and pulse until the chick peas are chopped and the mixture is a spreadable consistency. 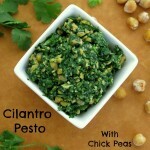 I totally dig pesto, the addition of chick peas is nice! Love that they were roasted first too! Thanks so much. I’m a big fan of pesto too! This is so different from anything I’ve seen! I absolutely love it. Can’t wait to give it a whirl! Thanks! I’d love to know if you try it! Oh, how I love the chickpea. Awesome how you used it here! Thanks! Chick peas have so many uses! I’m allergic to pine nuts, so it’s refreshing to see a pesto without them. I can’t wait to roast my own chickpeas now! Thanks Nikki! You’ve got to get inventive when you have food allergies! This looks awesome! I love cilantro and chickpeas! Definitely going to have to try it! I would love it if you would link it up with us at Tasty Tuesdays! Thanks! Heading over to check it out! I’d love to mix this into quinoa!!! YUM! What a great idea!! So smart to use chickpeas! This looks fresh and fabulous! This is brilliant – I love how you crisp up the chickpeas first! Thanks Aly! You have to crisp them or you get hummus!! This is such a unique pesto and I would have never thought to add chickpeas instead of nuts. I make tons of pesto but have never though to make cilantro pesto! I love this! Thanks! I’m ready to try another herb…or green using this method. 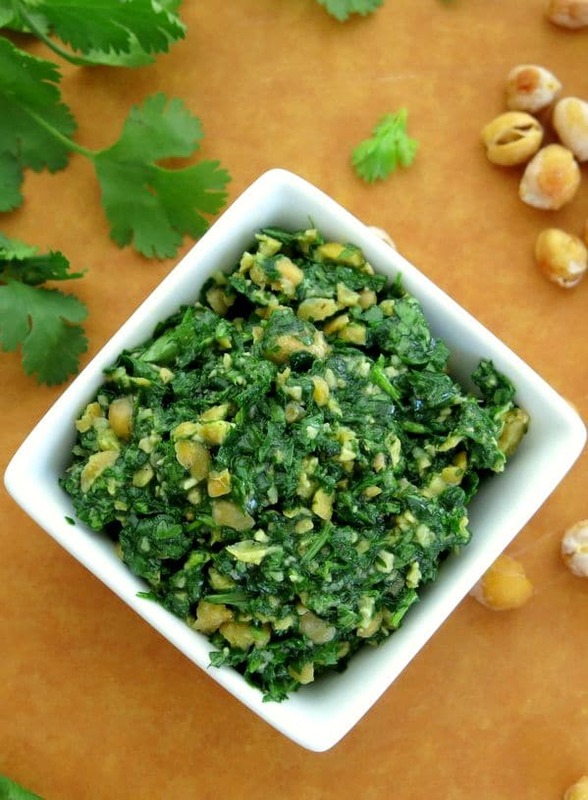 Wow, cilantro pesto is an excellent idea – it sounds mouthwatering. I also love chick peas, what a perfect combination. I love the addition of the chickpeas! Thanks! It’s a great sub for nuts! 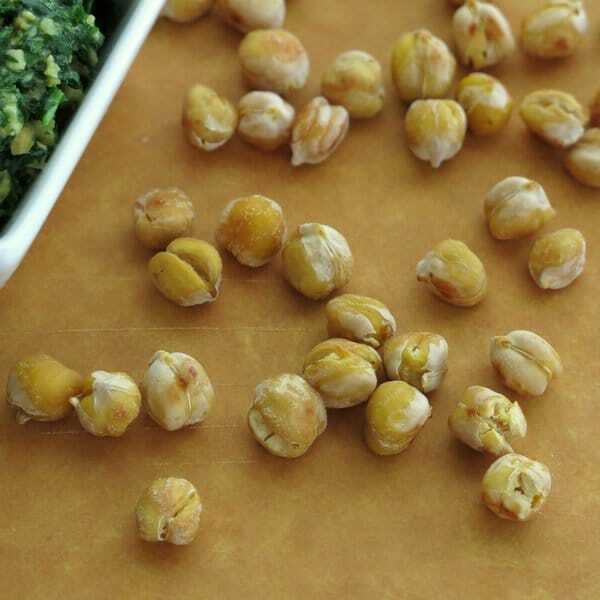 This is a great cilantro pesto chick peas recipe Marjory, as you know I made it a short while ago and it was lovely, in fact have made it again since. Thx for sharing! Thanks for your comment! There is a definite love / hate relationship. I hope you enjoy the pesto! Absolutely love your creative idea with cilantro pesto! Can I post it on my blog? Thanks for sharing! I”m so glad you like it! You’re welcome to share a picture and link to the recipe on The Dinner-Mom blog.